Building More Than Just Doghouses in Men's Leadership Project | Maxine Platzer Lynn Women’s Center, U.Va. Christopher Sausa remembers how awkward it felt being a seventh-grader. He recalls feeling “stuck in the middle – not a kid, but not a grown-up yet,” and he wished he had someone to talk to. But at the time, his father felt too far removed and his younger brother wouldn’t be any help. Now, as a fourth-year civil engineering major at the University of Virginia, Sausa is among the undergraduates mentoring seventh-grade boys through the Men’s Leadership Project at UVA’s Maxine Platzer Lynn Women’s Center. Two years ago, one of his roommates served as a mentor (the program uses “big brother” and “little brother” to describe the relationships) and he got Sausa interested. After participating last year, Sausa found it so rewarding, he returned to the program to mentor another seventh-grade boy this year. Yes, the Women’s Center started the Men’s Leadership Project 10 years ago – after hearing from male undergraduates that they saw how successful the center’s Young Women Leaders Program was and thought such a program was needed to mentor boys. UVA students Chris Sausa, left, and Garrett Lukens, right, mentor seventh-graders Messiah and Johan. The program pairs UVA undergraduates with local middle-school boys who meet once a week after school and also get together for other activities on weekends during the school year. The number of mentorship pairs varies from eight to 14. This year’s seventh-grade mentees come from Albemarle County’s Jackson P. Burley and Jack Jouett middle schools. Among the activities, there’s a UVA Day in the spring, when the big brothers bring their little brothers to the Grounds for a tour (parents can also attend). Sausa said they hope to plant a seed about what might be possible. The student pairings also typically volunteer on a community service project at least once a semester. 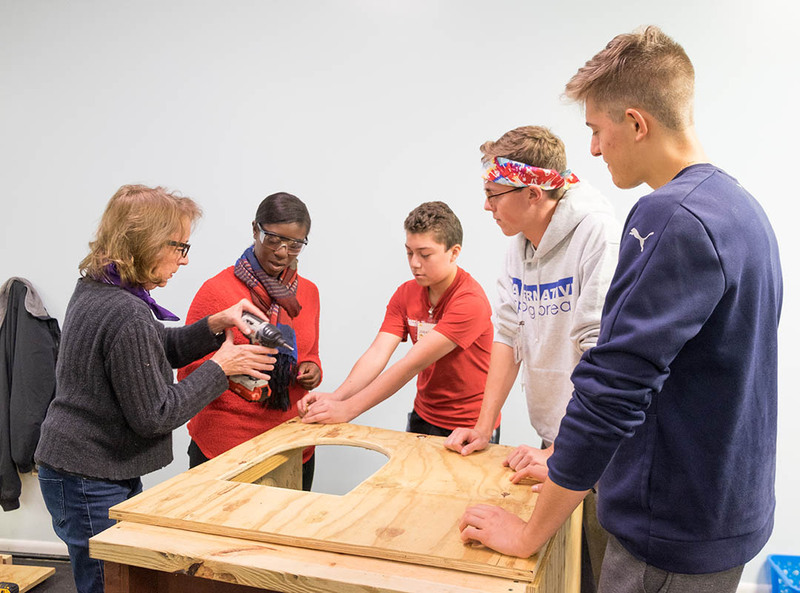 Earlier this month, they built doghouses with members of the Houses of Wood and Straw organization that will donate them to house outdoors dogs in Charlottesville and nearby counties. UVA student volunteer Tomoya Nishira, center, who mentors Damien, left, in the UVA’s Men’s Leadership Project, work with Houses of Wood and Straw volunteer Al Nestico to build a doghouse. The mission of the Men’s Leadership Project when it started is just as relevant today, if not more so: to create a mentorship program that would counteract the negative traits and limiting expectations of masculinity in our society – especially its links to violent behavior, including against women – by emphasizing positive attributes. Those positive traits? Being responsible for your actions, no matter what your age. Understanding what it means to have a sense of moral conduct. Earning the respect of your community, your peers and your family. Being a good friend, a good partner, a good father. “More and more, we are understanding the price men and boys play as a result of constrictive, toxic forms of masculinity. Unhealthy relationships, physical and emotional illnesses, and more. The people they love also pay a price,” said Claire Kaplan, who leads the gender violence and social change team, which includes the Men’s Leadership Project, at the Women’s Center. She founded the program with Christopher Elliott, who then was a doctoral student in the Curry School’s social foundations program and is now assistant dean of global affairs in the McIntire School of Commerce. Elliott, who serves on the Men’s Leadership Project advisory board, said that although the college mentors these days have been more exposed to issues about masculinity, they haven’t necessarily had a public way to talk about it and consider positive and negative aspects as they play out in real life. Sausa said the middle-school boys are influenced by unrealistic portrayals of young men – as if they all have that six-pack abs physique and lots of attention from girls. In the education class, he said they analyze case studies, compare myths and facts about masculinity, and discuss what’s happening in their mentoring relationships. Getting a professional opinion – Sheras is a clinical psychologist who researches adolescence, among several topics – really helped Sausa last year when he found out that the boy who was his “little brother” at the time was cyber-bullying a girl who didn’t want to go out with him. The boy thought he was acting cool, but Sausa helped him understand his feelings and the girl’s perspective. They ended up having a meeting where the boy apologized to the girl. It was gratifying to see this boy change last year, Sausa said, and he could see positive development in all the boys, he said. This year, he has also noticed his mentee coming out of his shell and can see his potential. Steve Hendrix, a school counselor at Jack Jouett Middle School who has long been an enthusiastic supporter of the Men’s Leadership Project, agreed, and said the boys really benefit from the engagement with UVA students. “What’s really important,” Hendrix said, “is what the boys learn from the big brothers: what it’s like in college, to work hard and to give back. And to have someone to talk with. “It’s a wonderful program and service that these college men provide. I’m impressed with them and their dedication to the boys,” Hendrix said.